I accidentally stumbled upon Osho's "The Path of the Mystic" where he talks about tea, and what tea is for Zen Buddhist monks. I was touched reading this, because I see tea and tea ceremony in exactly the same way. When you are here and now, when you are aware, when you are in the flow - then even the most ordinary tea is meditation. It is Beauty. The beauty of life is in mundane things - if we are aware. Question: How does the Man of Zen take his Tea? ... In Zen there is no God. In Zen there is only you and your consciousness. Your consciousness is the highest flowering in existence up to now. It can go still higher, and the way to take it higher is to create your whole life in such a way that it becomes sacred. A cup of tea is the most ordinary thing, but they make in every monastery a special temple for drinking tea, surrounded by beautiful trees, ponds... a small temple. You enter into the temple, taking your shoes off, and Zen believes, "Where you leave your shoes, leave yourself too." So you enter into the temple absolutely pure, uncontaminated. In the tea house, the tea temple, nobody talks. Only silence deepens. Everybody sits in the Zen meditative posture. The samovar is preparing the hot water for the tea, and the sound of the samovar has to be listened to as carefully as you have listened to your master. It does not matter what you are listening to, what matters is how you are listening. Zen changes everything and takes a far more significant posture: it is not a question of what you are listening to, it is a question of how you are listening. So it doesn't matter whether the master is speaking or the sound of the samovar. And everybody is sitting there silently while the tea is being prepared. Listening to the samovar... slowly the aroma, the fragrance of the tea leaves fills the temple. You have to be available to it as if it is divine grace. It is transforming everything small -- the smallest, most negligible things -- into something very significant, meaningful... giving it a religious color. And then the woman who is tending the tea will come to you. Her grace in pouring tea into your cups, and the silence, and the sound of the samovar, and the fragrance of fresh tea, creates a magic of its own. Nobody speaks. Everybody starts sipping the tea, tasting as totally as possible, being in the moment as intensely as possible, as if the whole world has disappeared. Only the tea is there; you are there -- and the silence. Now a very mundane affair... all over the world people drink tea and coffee and everything, but nobody has been able to transform the character of the mundane into the sacred. As the tea is finished, they bow down to the woman in respect. Slowly they go out of the temple without making any noise. In fact people all over the world don't enter into temples with such silence; in the temple all kinds of talking and gossips are going on. Women are enquiring about each other's jewelry and clothes -- in fact they go there to show off their jewelry and clothes; they don't have any other place to exhibit their possessions. All the temples and churches are nothing but gossiping clubs where people go to gossip about all kinds of mundane things. They destroy the whole meaning. And Zen has changed a very ordinary thing into an extraordinary experience. You will never forget drinking tea with a man of Zen. You will be fortunate if the master is present. Every gesture is filled with significance. It is called a tea ceremony, not tea drinking. It is not a tea shop or a tea stall, it is a temple: here, ceremonies happen. This is only symbolic. In the whole of life, around the clock, you have to remember that wherever you are it is a holy land and whatever you are doing it is divine. But just remembering will not be of much help. It is supported by meditation; otherwise it will remain a mind thing, it won't go deep. That meditation is always there to give it depth. So the whole day in a Zen monastery, from the morning when people get up till the night when they go to sleep, is a long prayer. They are not praying -- there is no God to pray to -- but they are prayerful, they are thankful, they are grateful. And with the meditation in the background, each small thing starts having new significances that you had never thought about. Who had thought that a cup of tea could have some spiritual significance? But in Zen it has. If you look just on the surface it may look like a ritual. If you are an outsider, it may look like a ritual. You have to be an insider to understand that it is not a ritual; they are really living it, enjoying it, because behind it is the world of meditation, silence. ...This is changing the whole ideology of ordinary mind: it judges the act, it never bothers about the consciousness out of which this action is born. An action coming out of meditation becomes sacred, and the same action without meditation is mundane. We have made our lives full of mundane things, mundane acts, because we don't know a simple secret that can transform the quality of everything that we do. And remember, if you don't know the secret of transformation, amongst those mundane things you are also mundane. Unless you have a consciousness which makes you sacred and holy, which is going to transform everything that you do into the same category in which you are... Whatever you will touch will become sacred. Whatever you will do will become holy. Zen is the very essence of all religions, without their stupid rituals, nonsensical theologies. It has dropped everything that could be dropped. It has saved only that which is the very soul of religiousness. So even drinking a cup of tea with a Zen master, you will find you are participating in a religious phenomenon. 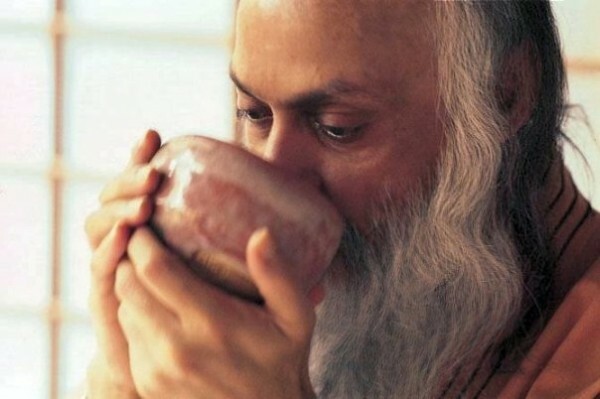 Osho "The Path of the Mystic"
Hello again, it's really nice to see you here!!! If you enjoyed this post, may be you would like to get e-mail updates (it's free). Совершенно случайно набрела на "Путь Мистика" Ошо, где он говорит о чае, и чем является чай для дзен монахов. Тронуло, потому что я вижу чай, и чайную церемонию точно также - когда ты осознан, когда ты здесь и сейчас, когда ты находишься в потоке - даже самый обычный чай - ето медитация. Это красота. Красота жизни - в обычных вещах, если мы осознаны. Как человек дзэн пьет чай? Для человека дзэн все священно - даже питье чая. Что бы он ни делал, он делает это в священном пространстве. Есть история о Моисее. Когда он пришел на гору синайскую, чтобы встретить Бога и получить Десять Заповедей, он увидел чудо: зеленый куст, ослепительно зеленый, а внутри - прекрасное пламя, огонь. И он приблизился, и кто-то из глубины куста крикнул: - Сними обувь. Это священная земля. Иудейская интерпретация состоит в том, что в этом пламени был сам Бог. Именно поэтому куст не горел: потому что Бог прохладен. И Моисей бессознательно входил на территорию, которая была подобна храму или синагоге: там был живой Бог. Он снял обувь и вошел. Не думаю, что в этом есть что-то историческое, но одно важно: где бы ни был Бог, эта земля становится священной. Дзэн подходит к вещам с противоположной крайней точки: где бы ни была священность, там есть и Бог. Где бы ни была божественность, там есть и Бог. Не наоборот - не присутствие Бога делает место священным, но если ты сделаешь священным какое угодно место, там немедленно почувствуется присутствие божественного, божественности. И они попытались привнести священное во все. Ни одна другая религия не заходила так далеко, так высоко, так глубоко. Ни одна другая религия не породила такой идеи. В дзэн Бога нет. В дзэн есть только ты и твое сознание. Твое сознание - величайшее из случившихся до сих пор цветений существования. Оно может подняться еще выше, и вот способ поднять его еще выше: сделать твою жизнь такой, чтобы она стала священной. Чашка чая - самая обыкновенная вещь, но в каждом монастыре люди дзэн создали специальный храм для питья чая окруженный прекрасными деревьями, прудами... небольшой храм. Ты входишь в храм и снимаешь обувь; дзэн верит: «Там, где ты оставляешь обувь, оставь и себя». И ты входишь в храм абсолютно чистый, ничем не загрязненный. В чайном доме, в чайном храме, никто не разговаривает. Только молчание углубляется. Каждый сидит в дзэнской медитативной позе. Самовар готовит горячую воду для чая, и звук самовара нужно внимательно слушать, как ты слушал бы мастера. Неважно, что ты слушаешь, важно, как ты слушаешь. Дзэн меняет все и принимает гораздо более важную позицию: вопрос не в том, что ты слушаешь, вопрос в том, как ты слушаешь. Поэтому неважно, говорит ли это мастер, или шумит самовар. И каждый сидит в молчании, пока готовится чай. Слушая самовар... мало-помалу аромат, благоухание чайных листьев наполняет храм. Ты должен быть доступен ему, словно это божественная милость. Это преобразует все мелочи - небольшие, не стоящие внимания вещи - в нечто очень значительное, осмысленное... придает этому религиозный цвет. И вот к тебе подходит женщина, приготавливающая чай. Ее грация, когда она наливает чай, и молчание, и звук самовара, и благоухание свежего чая создают собственное волшебство. Никто не разговаривает. Каждый начинает смаковать чай, испытывая его вкус как можно более тотально, как будто весь мир исчез. Есть лишь чай; есть ты - и молчание. Такое обыденное дело... во всем мире люди пьют чай, кофе и прочее, но никто до сих пор не смог преобразовать характер обыденного в священное. Когда с чаепитием окончено, все почтительно кланяются женщине. Медленно они выходят из храма, не создавая никакого шума. Фактически люди во всем мире даже не входят в храм в таком молчании; в храме продолжаются всевозможные разговоры и болтовня. Женщины спрашивают друг друга об одежде и украшениях - фактически они туда ходят похвалиться украшениями и одеждой; у них нет другого места, чтобы выставить на показ свои сокровища. Все храмы и церкви - не иное как клубы сплетников, где люди болтают о всевозможных обыденных вещах. Они разрушают весь смысл. А дзэн превратил самое обыкновенное в необычайный опыт. Тебе никогда не забыть чаепития с человеком дзэн. Тебе повезет если при этом будет присутствовать мастер. Каждый жест полон значения. Это называется чайной церемонией, не чаепитием. Это не кафе и не буфет, это храм: здесь происходят церемонии. Это только символ. Во всей жизни, круглые сутки, тебе следует помнить, что где бы ты ни был, это священная земля, и, что бы ты ни делал, это божественно. Но если просто помнить, это не окажет большой помощи. Это должна поддерживать медитация; иначе это останется умственной вещью и не проникнет глубоко. Именно медитация всегда помогает придать глубину. Таким образом, в дзэнском монастыре целые дни, с утра и до вечера, до времени отхода ко сну, - долгая молитва. Они не молятся - нет Бога, чтобы ему молиться, - но остаются молитвенными, благодарными, признательными. И, с медитацией на заднем плане, каждая мелочь начинает обретать новый смысл, о котором ты никогда раньше не думал. Кто бы подумал, что в чашке чая может быть такой духовный смысл? Но в дзэн он есть. Если ты смотришь поверхностно, это может показаться просто ритуалом. Если ты посторонний, это может выглядеть как ритуал. Нужно быть участником, чтобы понять, что это не ритуал; они действительно живут этим, наслаждаются этим, потому что за этим стоит мир медитации, молчания. Молчание не только внутри храма; еще более величественное молчание - у них внутри. Это не священность снаружи; еще более величественная священность - у них внутри. Целый день они целы - что бы они ни делали: убирая во дворе монастыря, работая в саду, рубя дрова, нося воду из колодца, готовя пищу. Что бы они ни делали, они делают это так тотально, что если только ты не участник, то сможешь увидеть только их действие. Ты не сможешь увидеть, откуда возникает это действие, - океаническую глубину у них внутри. Это изменяет всю идеологию обычного ума: он судит по действиям он никогда не заботится о сознании, из которого рождается действие. Действие, исходящее из медитации, становится священным, и то же самое действие без медитации обыденно. Чего бы ты ни коснулся, это становится священным. Что бы ты ни сделал, это становится святым. Дзэн - это сама квинтэссенция всех религий, без всех их глупых ритуалов, вздорных теологии. Он отбросил все, что только можно было отбросить. Он сохранил лишь то, что представляет собой самую душу религиозности. Поэтому с дзэнским мастером, даже сидя за чашкой чая, ты найдешь, что участвуешь в религиозном явлении.